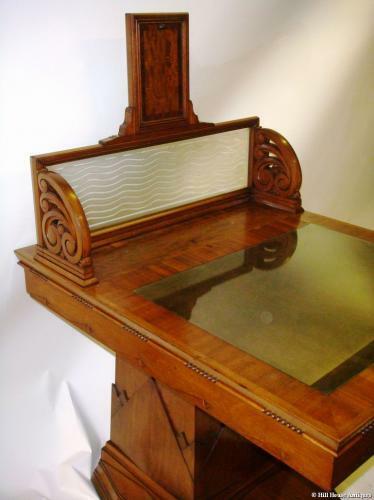 A most unusual and stylish walnut, high quality Scottish Art Deco table/desk, by John Taylor & Sons of Edinburgh (labelled). The rectangular glass inset top with framed & glazed calendar fitment atop a beautifully carved & glazed three quarter gallery section. The base of typical Art Deco geometric shaped stepped form. The unusual overall form and design, coupled with the “ crashing waves” carving of the gallery and etched wave design to the glazed gallery section, strongly suggests that this may have originally been made for and used in the main reception of one of the major Scottish shipping line companies at the time. The ability to display a changeable daily calendar at the front also strongly indicates such a use. Recent provenance: The Royal Bank in Edinburgh.